Worried by discrimination, stereotype and violence against women, traditional and religious leaders have been identified as key players towards promoting gender justice in Nigeria. 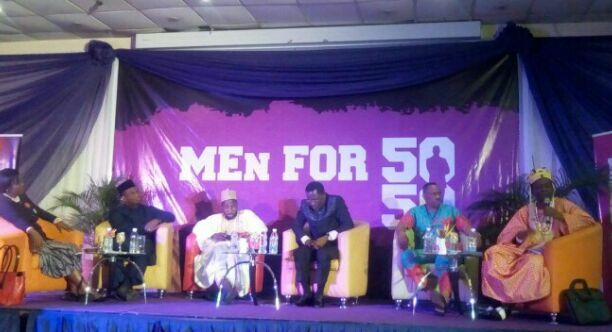 Voice for Change, Key Influencers Lead, Denis Onoise stated this in Lagos, Southwest Nigeria, during the opening ceremony of a two day conference “Men For 50/50” for 300 men (participants) drawn from Lagos, Enugu, Kano and Kaduna States where the group is currently working in. Onoise said the traditional and religious leaders are influential people in the society who can change and put end to violence against women. He said the group is working closely with the senior citizens because it is sensitive to the big role they play in the society and the country at large. According to him, “Your roles as senior citizens in this matter is to help us endorse our messages relating to preventing violence against women, that women can be leaders and women can make rules. And that is where we want you to come in, because we believe the young people listen and look up to you that when you make statements, everybody follows. “You can help the people make decisions. You need to help them understand that there have been misrepresentation and misinterpretations of the Holy Books. “No religion promotes violence against women and we want the traditional and religious leaders to dwell more on these areas. “Already, we have traditional leaders who have keyed into some of these things. They included women in their cabinets,” he said. He said the essence of the conference was to provide an avenue to strengthen the ties between the Religious and Traditional leaders, men’s networks and purple club as well as development of a common platform of men committed to and taking action on gender justice. Meanwhile, a partner and Kano State Coordinator of Young Men Network Against Gender Based Violence, Amb Emmanuel Gabari has described the event as a welcome development which will go a long way to address issues relating to the stereotype, discrimination and violence against women as a lot of mind need to be disabused. In attendance at the conference were Former Minister of Power, Prof. Chinedu Nebo, Yeye Adenike Oshibajo, Sheikh Mohammed Bin Usman and Diji 1 of Okpogho Ancient Kingdom, Enugu, Igwe Apostle Linus Chimereze to mention but a few.